Come experience our unique boutique Day Spa in a Resort setting. 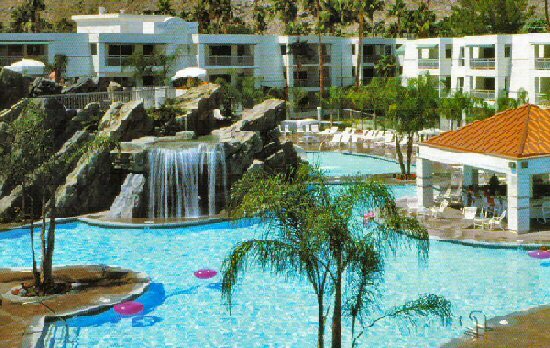 We are located in South Palm Springs, nestled against the mountains with fabulous views. Resort guests may relax poolside, soak in the Jacuzzi and enjoy our poolside Bar & Grille, "Splashes". COACHELLA FEST 2019 + STAGECOACH are coming to the desert! Are you ready? We've got you covered. Before, during & after. Escape by yourself or bring your family and friends! You know you've been wanting it. Book a relaxing Massage, Body Treatment or Hydrating Facial. Better yet, book a package. It's time to rejuvenate. We'll help you unwind. Everyone has different skin. We analyze your skin, determine what it needs and create a facial designed just for you. Skin is noticably fresh, hydrated and visibly improved. 2 hour advance notice needed for booking, based on availability. *Open on Sundays throughout the year on most Holiday Weekends (Memorial Day, Labor Day, Thanksgiving, Christmas & New Years)!